Each Saturday morning, 78-year-old Gary Patton goes door to door to talk to his neighbors about Hillary Rodham Clinton. He starts with a friendly introduction to make sure people know he's a local — not some out-of-towner who doesn't understand New Hampshire. His wife, Lenore, runs an email blast for the Rockingham County Democrats to keep people informed about coming visits by Clinton and every other Democrat in the presidential race. Since moving to Hampton in 1997, they've become the go-to couple for activists and candidates alike. Clinton sought their endorsement in a half-hour private meeting in 2007, but they eventually got behind then-Sen. Barack Obama. The Pattons are part of a cadre of political volunteers across the state that campaigns dream of getting on board: Locals who know the terrain and the people who count in every town and are willing to contribute relentless effort toward a campaign. As New Hampshire celebrates the 100th anniversary of its first-in-the-nation primary, activists and volunteers like these are keeping the contest's grassroots nature alive. Few volunteers know the Republican stronghold of Salem better than Judy Galluzzo, whose first race in the 1970s was an early campaign of former Gov. John H. Sununu. She's been active ever since, running campaigns on a volunteer basis for the local register of deeds, the county attorney and many more. She organized the town's Labor Day picnic in 1999, when Elizabeth Dole cruised in on a motorcycle. She hosted a luncheon for Ann Romney and, most recently, organized a town hall event for Florida Sen. Marco Rubio, her chosen candidate in 2016. 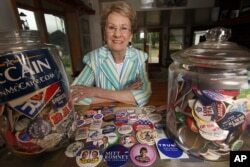 Judy Galluzzo poses with campaign buttons she’s collected over the years, in Salem, New Hampshire, Aug. 21, 2015. Volunteers like Galluzzo bring important assets to the table: instant credibility, know-how and “infectious enthusiasm,” said Jim Merrill, Rubio's state director and a veteran GOP operative here. “Any campaign's goal is to try to find as many of those folks as possible throughout the state,” Merrill said. The Pattons have a similarly long history of political involvement, starting more than 40 years ago in Pennsylvania. While there, Gary Patton led county organizations for the presidential bids of Michael Dukakis and Bill Clinton. When the Pattons moved to Hampton, they got involved in the local Democratic party right away. Lenore remembers having a chance to meet Obama during his first campaign after an event at the local high school, offering her a close-up glimpse that most voters never get. The Pattons are now avid Clinton backers. For them, political volunteerism is essentially a full-time retirement job. As primary day approaches it keeps them busy - and having fun.